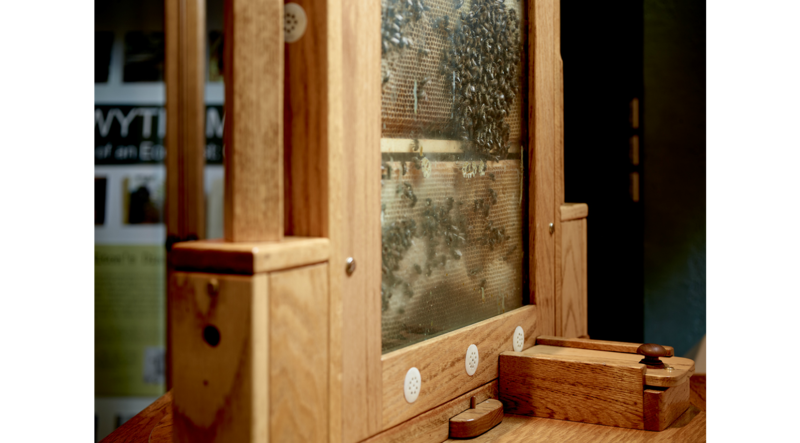 Hand-built especially for the Museum, this beehive reveals honey bees at work. 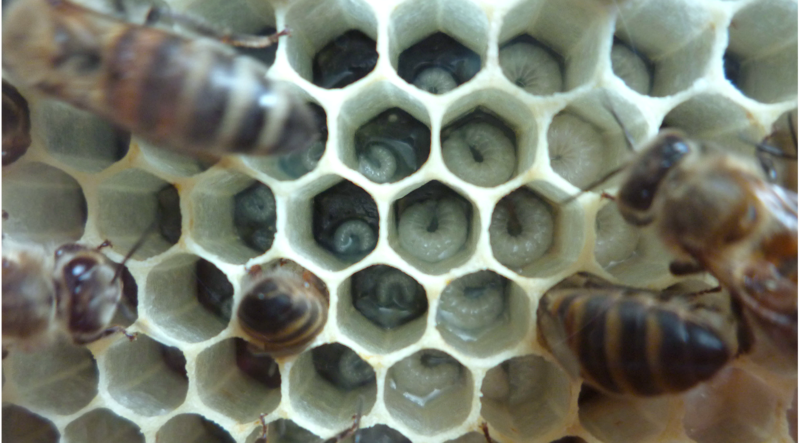 Look closely and you can see eggs, larvae and even the queen bee. 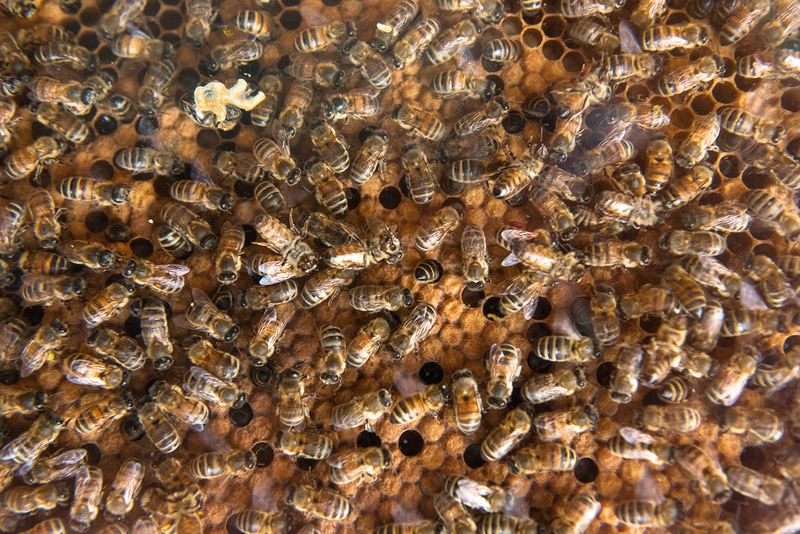 The Queens Crown of red, our new Queen is marked with a Yellow Crown – can you spot her? As one of only a handful of observation hives in the UK, the Museum’s glass-sided beehive allows a unique glimpse into the daily life of a working colony of European honey bees (Apis mellifera). Honey bees are one of the few truly social insects; a colony consists of a queen, hundreds of female workers and a small number of male drone bees. The queen is the only bee in the hive able to reproduce by laying eggs, and she can be seen doing this regularly during the summer months. 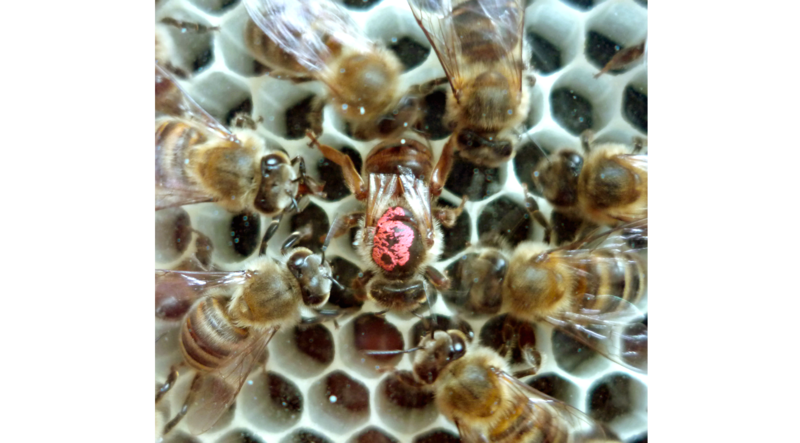 The queen bee is around one and a half times larger than the worker bees and has been marked with pigment on her thorax, making her easier to spot. Male drones are also quite large and can be distinguished from the queen because their eyes meet in the middle of the head. Males are generally lethargic and only become active when virgin queens emerge from the hive for their nuptial flight. Worker bees, on the other hand, are constantly active. Workers clean, defend and fan air through the hive, tend to the queen, raise the young bees, collect pollen and nectar, remove the dead, produce honey and generally take care of all the other little jobs that help keep the colony thriving. Workers that have found a source of food communicate its location using a special ‘waggle dance’. The angle and duration of this dance tells the other bees the direction and distance to the food source. 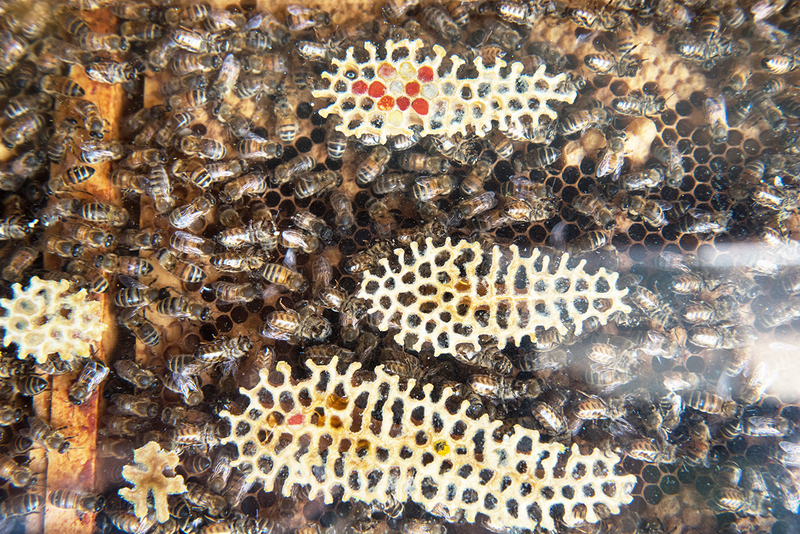 If you look closely at the individual cells in the hive you will see the newly laid eggs, larvae at different stages of development, capped cells containing pupating bees and food storage cells for the hive’s stockpiled supply of honey and pollen. Occasionally, you may also see larger more bulbous cells, which may contain drones or a new queen. Bees exist in a great diversity of shapes, sizes and colours. Discover the amazing variety of bees found around the world. Young volunteers Genevieve Kiero Watson and Poppy Stanton tell the tale of the Museum’s resident wool carder bee and their investigative bee work in our Life Collections. Want to see more highlights from the Museum's collections?